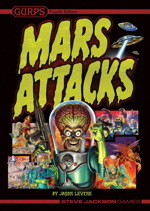 Daily Illuminator: Pre-Order GURPS Mars Attacks And The Discworld Roleplaying Game Today! September 21, 2016: Pre-Order GURPS Mars Attacks And The Discworld Roleplaying Game Today! Now is a fantastic time for GURPS fans. In addition to the Dungeon Fantasy Roleplaying Game on Kickstarter -- watch those stretch goals fall! -- two new GURPS hardcover books are at print and set for release later this year. And now, both GURPS Mars Attacks and the Discworld Roleplaying Game are available to pre-order at your favorite local game store or Warehouse 23. Pre-Order At Your Favorite Local Game Store: Use one or both of these handy forms to pre-order today. All you have to do is print out the form, fill in all of the details, and then drop the form(s) off at your local game store. GURPS Mars Attacks pre-order form. Discworld Roleplaying Game pre-order form. Warehouse 23: If you do not have a favorite local game store, you can pre-order both books today at Warehouse 23. And once your pre-orders are in, please don't forget the Dungeon Fantasy Roleplaying Game that's currently funding at Kickstarter. The project has a little over a week before it closes, so join in today and don't miss out on this fantastic new stand-alone RPG box set.